Ramps, Ramps, Ramps! The elegant two-leafed Wild Leek, or “Ramp” (Allium tricoccum), is a beloved Spring wild edible across this country, and the growing popularity of this delicious plant is a happy sign of the regeneration of our connections to the wild as a society at large. But is this Rampage good for the Ramps? Some say “yes”, some say “no”—and ultimately, it comes down to each individual harvester and consumer of this fragile Spring ephemeral. 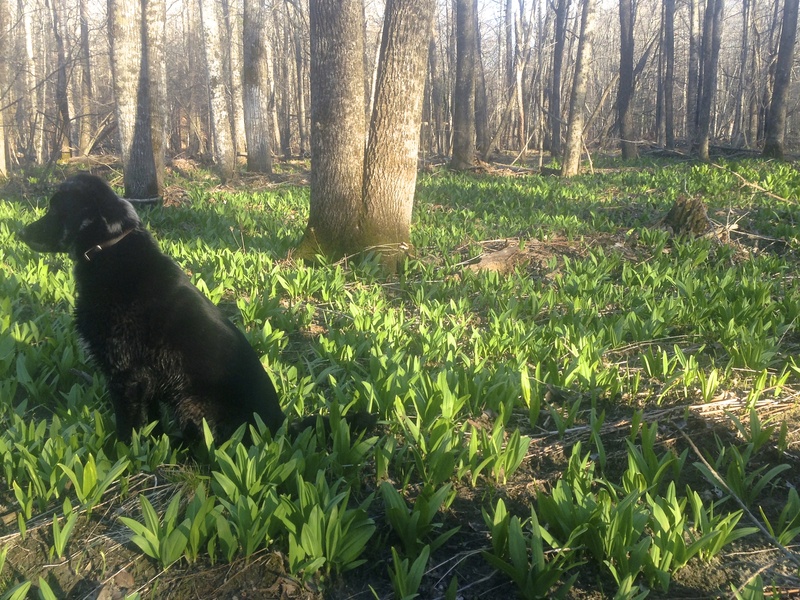 HOW we harvest and treat the Ramps determines whether our love of this plant will help it spread and thrive, or whether it will go the way of the over-harvested Goldenseal and other beloved plants which are no longer abundant. So, how do you make sure your Ramp cookery is part of the solution? First of all, if you’re harvesting your own Ramps, you have the chance to spend some time with the population you’re harvesting from and get to know them. How do they like to grow? Are there any threats to their habitat that you can assist to mitigate? Invasives encroaching on their territory? Threats from development or insensitive land usage? You can help! Secondly, you can choose to harvest either the whole plant OR just the leaves. It’s possible to harvest entire plants and support the whole population even with this lethal harvest practice by doing it only to thin crowded patches, and by re-populating and spreading the Ramps through transplanting or seeding. But it’s also easy, more sustainable, and just as delicious to harvest only one leaf from each plant, leaving the rest of the plant to grow and produce seeds for another season. Please consider this method! Thirdly, if you’re buying Ramps, you have the chance to ask some questions about their source. Who is harvesting them, and how? How long have they been harvesting from that patch? Is the Ramp patch growing or shrinking over time? What are they doing to protect Ramp habitat in your area? Are they harvesting the bulbs and roots or just leaves? You should feel good about your hard-earned money going to support ethical and connective harvest practices that will benefit the Ramps you love over the long haul. And at last… you have your bunch of delicious Ramps in hand. They’re clean and fresh and smelling divine. What do you do with this these amazing plants to best honor the gift of their leaves and lives? There are so many delicious options! I admit, I have a hard time keeping them around long enough to cook because I love them best raw. I nibble on them fresh, chop them up in salads, and put them in sandwiches. The fresh, spicy flavor is unique and will light you up with delight. But it’s also delicious to sauté them in butter or oil (they’ll cook down a lot, beware! ), and serve them as a side dish or as a bed for a main course (I like line-caught lake fish!). Or, you can use them to make a tasty sauce to drizzle on other food. Ramp quiche? Ramp soup? Ramps and mushrooms with pasta? Get creative! Enjoy your Ramps! And thank you for your commitment to merging caretaking mentality with gourmet cookery. It’s a happy marriage that supports us all. Happy feasting, and may you find wild edibles along every path you walk this Spring!